I was contemplating buying Montessori “moveable alphabets” but I was not willing to part with my dollars for two set of capital and small letters. Then an idea came. I will create my own version of “moveable alphabets” using alphabets cut out off the magazines and flyers. As there are 26 alphabets, I went in a search of a 26-compartment container and the best I could find was a 24-compartment container, which I bought from a neighbourhood hardware shop at $3.20. The last three alphabets will have to share the same compartment. Dot is keen to help me find the alphabets in the magazine as I cut them. 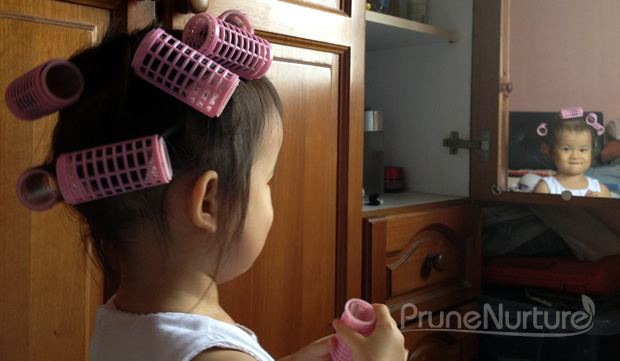 This simple activity definitely helps to heighten her awareness of print around her. Dot doodles and pastes the alphabets on the homemade A5 booklet I made for her. 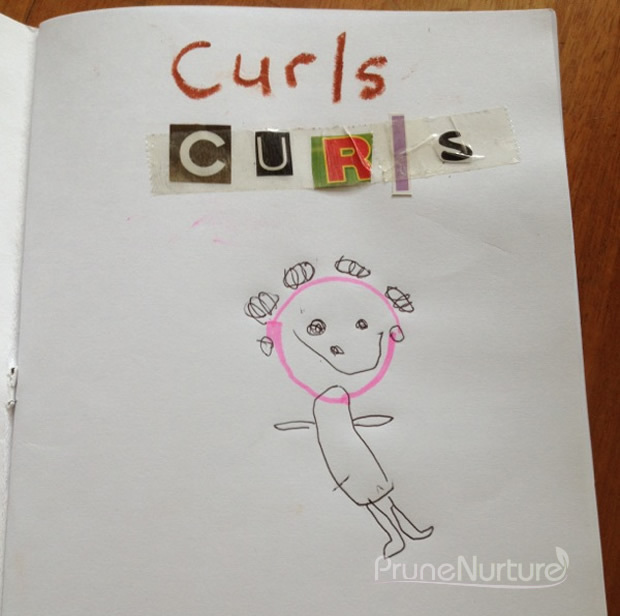 This booklet journals some of the activities that she did during her day – a mini diary of hers. My brother had this crazy idea of curling Dot’s hair and we had so much fun playing with her hair. She did her first entry in her journal, with a little help from me. 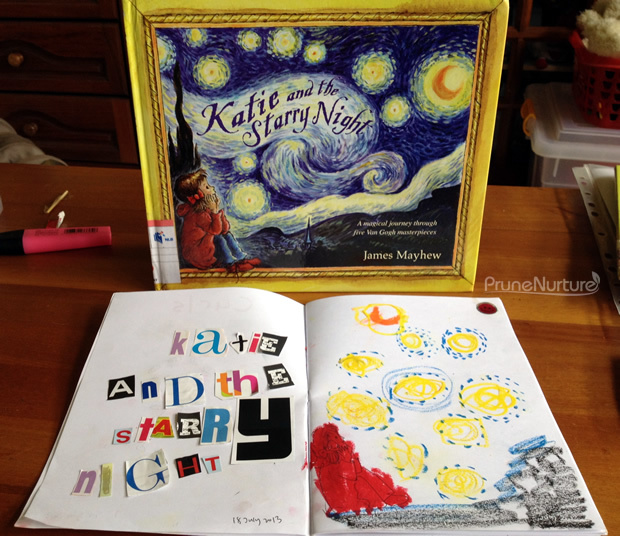 Katie and the Starry Night is Dot’s first book to Vincent Van Gogh’s artwork. It is one of the favourite books we have borrowed from the library. I love the mini diary you made 🙂 and I shall hunt for a similar compartment box. Thanks! Yes, montessori moveable alphabets set is expensive :(, but I found a cheaper one from amazon http://www.amazon.com/Lakeshore-Learning-Materials-Color-Coded-Magnetic/dp/B004ZAKX1M/ref=sr_1_20?ie=UTF8&qid=1375075988&sr=8-20&keywords=lakeshore and asked my colleague help to buy when he went back to US :). 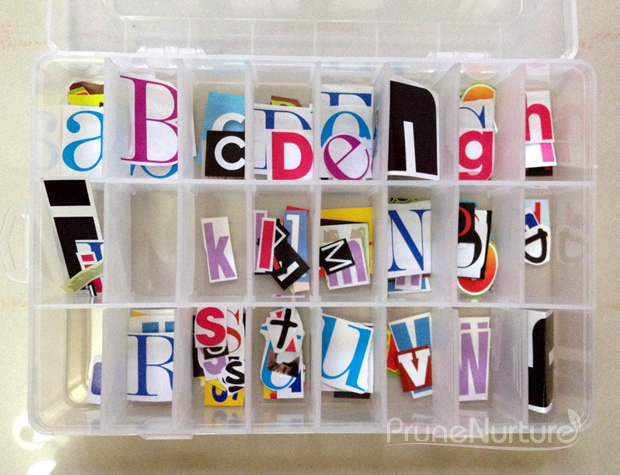 I also managed to get a compartment container to keep the alphabets w/o sharing space : ).